Become a wildlife explorer for a day and discover what’s living right on your doorstep by joining in at Norwich’s first major BioBlitz. Our team of experienced naturalists and wildlife watchers need your help to find and identify as many different species of birds, bugs, plants and beasties as we can before the clock runs out. Just like a real scientific expedition, everything we find will be documented and passed on to local and national databases that monitor our local wildlife. With interactive activities for kids, grown-ups, beginners and experts alike there is something for everyone at a BioBlitz. A community-led Bioblitz of one of Norwich’s richest sites of natural and local history is set to record species through an army of citizen scientists for the first time in the city. Supported by the Heritage Lottery Fund, the event aims to record as many species possible in one day – 27 May – in the 12 acre Train Wood, which is at the start of the Marriott’s Way and next to the River Wensum. There will be walks and talks on railway history too, harking back to the days when the site was Norwich’s ‘City Station’. The event will be suitable for all ages and all activities will be free. Throughout the day there will be nine expert-led walks of the woods, covering birds, railways, wildflowers, trees, butterflies and dragonflies and bees. And a series of fun activities for children will see the whole wood brought back to life as a railway, with wildlife, minibeast, butterfly, plant, bird and bat recording ‘stations’ which the public make their way round. There will be activities ranging from learning how to use a field lens, to making a bird feeder – all free. There is no parking so visitors are encouraged to walk the short distance from the city or cycle using the Marriott’s Way. Train Wood is near Halfords, close to Barker Street and the St Crispins roundabout at the bottom of Grapes Hill: NR2 4UB. There will be facilities on site including a coffee van and toilets. 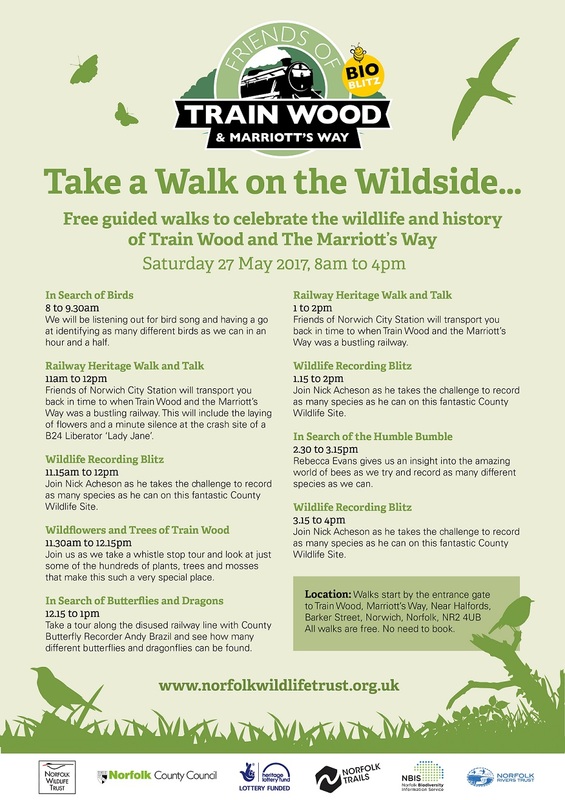 Walks start by the entrance gate to Train Wood, Marriott’s Way, near Halfords, Barker Street, Norwich, Norfolk, NR2 4UB. All walks free, no need to book. Enormous thanks to everyone involved in running this special event!